And Real Jew News has been harassed by the “Anti Defamation League” by intimidating my last two Web Hosting Companies and causing them to shut down Real Jew News without warning. I have incurred much expense both in money & time because of the ADL’s intimidation tactics. Americans are asking, “Why does the ADL hate us?” They hate us right here in our Internet chambers - a bastion of free speech. The ADL hates our freedoms - - our freedom to publicly display our love of Christmas, our freedom of speech, our freedom to have the press publicize all available presidential candidates, our freedom to disagree over US policy towards Israel. The ADL indeed hates our freedom to disagree over US policy towards Israel. An example of this is illustrated in the incident known as “The Judt Affair.” On October 4 2006, a renowned NYU historian by the name of Tony Judt was scheduled to speak at the Polish Consulate in Manhattan. Judt was to give a talk on the Israel Lobby & planned to argue that the Israel Lobby stifles honest debate. An hour before Judt was to arrive, the Polish Consul General, Christopher Kastryzk, canceled the talk. Kastryzk said that the Anti Defamation League had called and exercised “delicate pressure.” He quickly concluded Judt was too controversial. It was later discovered that it was Abraham Foxman, ADL’s director, who had called Kastryzk. “The Polish Consulate made the right decision. Mr Judt has taken the position that Israel shouldn’t exist. That puts him on our radar. We’ve been keeping tabs on Mr Judt.” View Entire Story Here & Here. “This is serious and frightening. This is a Jewish organization that believes they should keep people who disagree with them away from anyone who might listen.” View Entire Story Here & Here. And that about sums it up doesn’t it my fellow Americans? We have a true terrorist organization and terrorist leader right here in the good ‘ol USA. The ADL is run by the Jew, Abraham Foxman, who calls the New Testament “Anti Semitic.” Foxman, the wicked Anti Christ Jew ,has called for the New Testament to be banned, this wicked Anti Christ Jew. Where was Foxman when the New Testament was burned by the hundreds in Israel 6 months ago? Not a peep out of his wicked Anti Christ mouth! The ADL is a very powerful “Israel Lobby” which has a branch in Jerusalem. Thus they are lying that their mission is to ‘combat’ Anti Semitism. No, the ADL’s mission is to STOP all criticism of Israel and promote this racist, murderous, rogue state. After 12 hours of grueling work and fighting with Apollo Web Hosting to gain access to the Control Panel, and probably another $1200 to pay a Web Master expert, Real Jew News is back up with a 4th Web Hosting Co. Hopefully this one will stick as they promised. They host the peppery Web Site, Jew Watch.com. BUT - I am out of much money and will be forced to borrow money from some Credit Cards if I cannot raise some funds. Recently I asked for help for an upcoming Washington DC trip. Not too many were willing to help out. It looks like I will have to cancel the trip due to this surprize hit from the ADL and the high costs incurred to switchover once again. REAL JEW NEWS averages 180,000 visits, not including page visits per month. But VERY FEW are willing to help out with appeals and to keep this site running which COSTS MUCH MONEY. The band width required to carry the multiple picures incurs much monthly expense. Research and purchasing books also incurs much expense. I need help to keep this site going and to pay for yet another switchover. Please consider helping as I will have to cancel the DC trip and borrow money to pay for everything that has hit me on Saturday - not to mention the $1200 dollars that half is still due from last month’s banning by the ADL. Foxman wanted changes to the script. Did he and Hollywood Jews arrange for ‘Christ’ to have an injury to one eye in the movie, so that ‘Christ’ would be a blemished sacrifice for the sins of humanity and thus unfit as a Saviour? An eye injury rendered an animal sacrifice under Levitical law unfit as an offering to God. This is all part of the great battle between Christ & Satan. When the devil took Jesus to the top of the Temple to tempt him, by that time he already controlled the Apostate Priests who had paid for their positions in the priesthood. No longer did prophets appoint the priests. God had not spoken to “His chosen people” for over 400 years because they had broken the covenant. They no longer kept God’s laws and instead used the oral laws that the Rabbis had come up with in Babylon to tell the Hebrews who failed to stand up for God while captive in Babylon, that they could bow down to the Golden statute the King had set up. Only Daniel and his 3 friends had the courage to refuse to bow down and break the Commandments of God. Those oral laws became the Talmud. That’s NOT the Old Testament that John Hagee’s “Christians” think the Jews believe in. By 1906 they had the “Protocols of the Elders of Zion” to go by, and the Jews are right, they weren’t written by them, but rather by Satan himself. No human could think up such evil on their own just like no human could have written the bible on their own. The two documents reveal God’s plan and Satan’s plan. We are now locked in a great battle between God and Satan here in America where the last First Amendment that God provided 200 years ago is barely hanging on by a thread. Satan’s servant George W. Bush abolished 9 of the first 10 Amendments in 2006, and that is preparing the way for his New World Order. Good honest Jews must study the 9th Chapter of Daniel and see that was a time prophecy that extended 490 years from 457 BC to 34 AD. Gabriel told Daniel that The Anointed One would be killed “seemingly for nothing” in “the middle” of the 70th week of days, and that would be 31 A.D. the very year Foxman’s friends the Pharisees murdered Christ. In my own Church the elders hid the 9th Chapter of Hebrews from my view exactly the same way the Rabbis have hidden the 9th Chapter of Daniel from Jews. I didn’t understand the Atonement because it was hidden from me, and millions of Jews don’t understand it because it was hidden from them. Satan used the same trick in both religions. 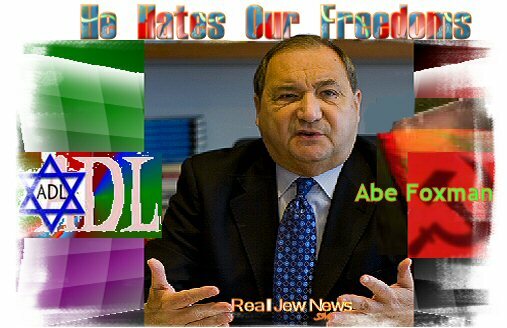 Abe Foxman’s devilish assault on American freedoms because “he hates our freedom” is going to bring the Gospel of Christ to millions of Jews. Now we know where the Jewish media came up with that absurd charge that the Arabs “Hate our Freedoms.” THEY are the ones who “Hate Our Freedoms.” Fox News is a caldron of lies and Apostate Christians are falling for that Satanic nonsense. The honest Jews will see there’s something wrong with a group that suppresses open debate about anything, and that Israel pulled off 911 and also that their elders hid the real truth about Jesus Christ from them all along, and that Israel is NOT something to do with religion at all. All it takes is an honest human being willing to suspend what they’ve been taught, and to look at Isaiah 53 and open their eyes. To lie about Osama bin Laden when he had nothing to do with 911 is breaking the 9th Commandment. A Jew cannot be religious and honest with himself and God and break the 9th Commandment at the same time. The more Foxman works against Christians and Freedom, the more he’s going to convert honest open minded Jews to Christ. Satan and his servant Foxman cannot win this battle. My budget has taken a nasty hit this month so I shall not be sending you my customary donation least I may not be able to put food on the table in the last days. However I will sent you this dollar thing, it will cost me $1.42 to complete the transaction. And with this I challenge all your readers to do the same. The cat is out of the bag for Americans about AIPAC’s strong-armed tactics in Congress and about Lieberman’s campaign to get rid of YouTube videos telling the truth about Israel. (I can’t wait to vote him OUT!) Americans “used” to think “poor little Israel” — it’s being attacked by all those Arab nations. NOW WE THINK, “What a bully, they spy on Americans and were caught spying in Mexico. It’s being reported in many news articles that they’ve intentionally shot our servicemen for their own propaganda purposes. I wouldn’t be surprised if they had a lot to do with 9/11 since 3 of them were seen dancing (on cars?) that day in the street. Americans DO NOT want to contribute any more foreign aid to Israel, or support their constant war-mongering and intentions to attack Iran. Israel recently hired a publicity company to improve their image. TOOoooo Late! We’ve found you out and are paying attention at last to your dirty, dirty political shenanigans. As a Polish Citizen I must express how embarrassed I am by the cowardly actions of the Polish Embassy in New York cancelling Mr. Judt speaking engagements. The freedom of speech has been always suppressed in communist Poland so I truly enjoy and respect it now living in Australia. Where is the Polish solidarity gone? Shame on you Polish diplomats! I sent you, several days ago, $40.00 and hope you will get them soon. By the way, I decided to pray for our troubled brothers from ADL and Abe Foxman. May our Spiritual Creator forgive them!!! Dear Eternal Love - Did you send a check or cash? I dont recall geting anything. In several days you will get the money and the card. Yes, we have to pray for our not so developed brothers, I mean their Souls, and to send them a lot of Love…this could help!!! However, it is with this great Website of yours’, Brother Nathanael, that ‘Real Americans’ do know the World and are fully aware of the consequences of having a Zionist Jew-dominated Media and Political Machine representing them to the World! Real Americans believe in The Constitution and The Bill of Rights!!! It’s interesting, Wall Street financed both the rise of communism and fascism in Europe…but never, not even once, have I seen a Major US Media showcase this ‘black spot’ on American History! …and yet, denouncing “Communism” is labeled Anti-Semetic…which is why we don’t hear on television the Modern Day Russia being called ‘Communist’…which is Great! (…because it is not!!!) However, Russia is targeted by US/Israeli Media as ‘the agressor’…when, in actual fact, it is the other way around!!! 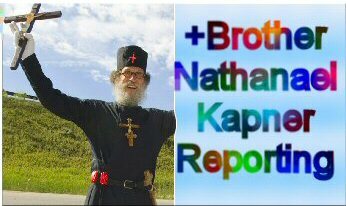 GOD BLESS AMERICA and GOD BLESS Brother Nathanael and RealJewsNews!!! You do the United States a Great Service! ..and to those who know their US military history, know that General Patton wanted to finish the Bolsheviks off, right after Berlin!!! Eisenhower put ‘the brakes’ on that plan! FOXMAN IS A LIAR/DENIAR OF MODERN HISTORY!!! “My European colleagues and forebearers have been running this scam for centuries. Whenever some independent-minded foreign mayor resists our Monopoly game, (Saddam, Putin, Chavez, Ahmadinejad)…should not Hitler’s name also be in this list? Was not his greatest ’sin’ the seeking of coming out from under the Jewish bankers’ control? And, following on in that vein, should not the scam artists’ last names be included? Names ending in -berg, -witz, or -stein? Looks like that freedom of speech is perhaps more respected in the former communist countries than in the US. As a young man he has been an avid and good singer in a choir of Vienna’s opera, plus a very good painter, I’ve seen a lot of his works, portraits, beautiful flowers, etc. I was stunned how a killer, could have such fine soul to paint these good pix. Also I do not understand how a simple Austrian boy could become a Leading figure in Great Germany… Did not they have their own man to be chosen for that role… and who has given him a German citizenship? Obtaining German citizenship is a very difficult thing. To me Hitler was chosen by some group to be the next scapegoat, used by the real executers as smoke screen. This group uses the method of choosing some victim, doing its job, and after accusing the victim in all evil things perpetrated by them. The Group has been hiding not only behind individuals, but also behind countries, example Russia, October revolution, USA, all these wars, Germany, etc. The ADL and all Jewish watchdogs overuse the term Anti-Semitism in stifling criticism of Jews and Israel’s policies. I have a problem with the term Anti-Semitism. This term was invented in the 1870’s by the German journalist Wilhelm Marr to describe the non confessional hatred of Jews. Most Semites in the world today are Arabs and there are over 300 million as opposed to 13-14 million Jews worldwide. Most Jews do not speak Hebrew which is a semitic language and this language is mainly spoken in Israel. One can therefore say that there are about 5.5 million Hebrew speakers as opposed to 300 million Arabic speakers. How can the Jews then use the term Anti Semitism when they themselves are a small minority of the Semites? So why do they hide behind this problematic term, does it sound better or is the more direct Anti Jewish too harsh and to the point. A defence we Christians worldwide can use when we are being labelled with this term is ” we do not hate Arabs” therefore as they are the majority of Semites the accusation is wrong. Lets play semantics with the Jews. Am I anti Jewish YES are the JEWS Anti Christian YES therefore we are even. Let us all start by labelling all Jews as Anti Christian playing them at their own game. We can all start today by labelling every Jewish criticism as Anti Christian. Greetings in Jesus Brother Nathanael. I find it amazing how Christians are buying the message of zionism as biblical truth when it teaches no such of a thing.John hagee is pushing this heresy as sound doctrine and his message is indeed enlarging hell daily. The pre-trib doctrine is another false doctrine and seminaries especially dispensational ones are infected with satanic Roman Catholic Jesuit teachers pretending to be protestants and the students are paying for satanic doctrines and are indeed helping the new world order through the dispensational heresies they believe are biblical doctrines. The Church will go through the coming great tribulation.Tim Lahaye,Billy Graham,Kenneth copeland,ect all of these men are satanic masons on stage pretending to be christians when in fact they are not. God bless you for exposing the workers of satans kingdom. Hey your famous Brother Nathaniel, your name was mentioned at ynetnews.com. It means your effective in my view, keep up the incredible work and God bless you. Yes the Zionist Organization is the group who create problems in America. Fox news is the leading media in America who have all these Zionist propaganda persecutors who whitewash and indoctrinate Americans minds. Had the radicalized Zionists not caused so much trouble in the Middle East, our Country would not be suffering now. Now in America the Zionists are persecuting traditional Americans, inside the Judaical system and stealing our rights away from us because they are greedy. In America the media is under the Zionist Political authority of power and the media will not expose crimes Zionist commit on Americans, so they can profit. The media is under the control of Zionists and they have been involved in CENSORSHIP, in many cases in America. Majority of Zionist ARE converts TO Judaism, and become terrorist dictatorship personalities; radicalized Zionists the same as terrorist to radical Islam. Once you become a victim of Zionists than you understand the religious radicalism you will be subjectived to. Majority of Fox News propagandists - racist Zionists are causing world trouble. Then they hide behind the word anti-semitic. Semitic peoples are born in Middle Eastern Countries. These Zionists are not Semitic in race they are white people. My Jewish interaction has been hurtful and these days spiritually painful. Was married to an athiest Jew, had 2 children (2 amongst another 9? so far). Needless to say he had a buyer ready to sell my son when he was just born, thus a very short lived marriage. My children were baptised Orthodox Christians. His family never wanted to know us three. And for my biological family, well “..we were not good enough (materialistically)”. So the children grew up with me only. Then I converted to Judaism (not by choice, but by ignorance ) - ‘those who worship baba’ and are into lust and greed etc. For some strange reason I visited an Orthodox church during the epitaph procession (having been a cultural Christian in my upbringing), and a force pushed me out of the church. Anyhow there were other manifestations which solidified my faith as a Christian. After 10 years of having left Judaism, which was not easy to do (as you know) I got re-chrismated in an Orthodox church. At some stage prior to getting chrismated, the Lord Jesus Christ spoke to me 3 words whilst I was trying to sleep. Recently my son who turned 20 and was suicidal just got up an left telling me and his sister we will never see him again. It’s been about a month since he left, and now my daughter (with an aspiring scientific intellect) won a scholarship and has hinted she will be leaving. In fact, she didn’t touch her breakfast this morning, nor took her lunch, didn’t say a word to me and left whilst I was in the shower. I sympathise with the spiritual pain you are feeling, having to separate from your family. I too have lost everyone. I live alone but glory be to our Lord we have Jesus Christ living with us, something no one can take away from us. The lake of fire is a terrible eternal reality for those who have scarred us and our loved ones. God Bless!